LA CROSSE, Ind. (1/16/2012) - Indiana National Guard Spc. 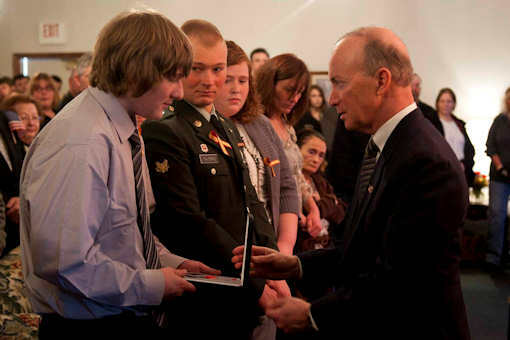 Robert Tauteris Jr., 44, of Hamlet, Ind., was laid to rest Sunday, Jan. 14, 2012, in La Crosse, Ind., in a full military honors with family, Indiana National Guard Adjutant General, Maj. Gen. R. Martin Umbarger, and Indiana Governor Mitch Daniels. 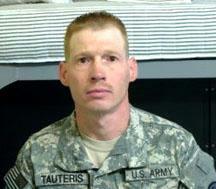 Tauteris was a combat engineer with Indiana's 713th Combat Engineers, headquartered in Valparaiso, Ind. He and three of his fellow soldiers were killed Jan. 6 in Kandahar province, Afghanistan, of wounds suffered when enemy forces attacked their vehicle with an improvised explosive device. Also killed in the attack were; Staff Sgt. Jonathan M. Metzger, 32, of Indianapolis, Ind. ; Spc. Christopher A. Patterson, 20, of Aurora, Ill.; Spc. Brian J. Leonhardt, 21, of Merrillville, Ind. families and will defer to their wishes concerning media engagement.